I'm happy to report my latest project, PillAware, is available for iPhone and iPod touch. You can download it on the app store today. PillAware uses iBeacons and reminders to help you remember to take your daily pills. PillAware is an app that is very personal to me, as I have struggled to remember to take meds daily now for several years. Additionally, information about accuracy of taking those pills, and remembering when to order new pills has been a big effort. Version 1 of PillAware starts to solve some of these problems. I'm confident with future updates I will make big strides in solving everyday pill taking problems. Been working on a project that involves iBeacons as of lately. Thought I'd share some of my notes here. Discovered somewhat late in the game that you CANNOT search for any and all available iBeacons in the area. You have to know the UUID before you can interface with an iBeacon. Thankfully, the manufacturers of these iBeacons have been using consistent UUID's and just changing their Major and Minor values of their beacons. I've compiled a list of common UUID's, which in theory could be used to search for available Beacons. Note: I'm not sure about each of these items, but I have verified that Estimote is correct. If you have experience with any of these UUIDs or any that are not listed, please let me know in the comments. 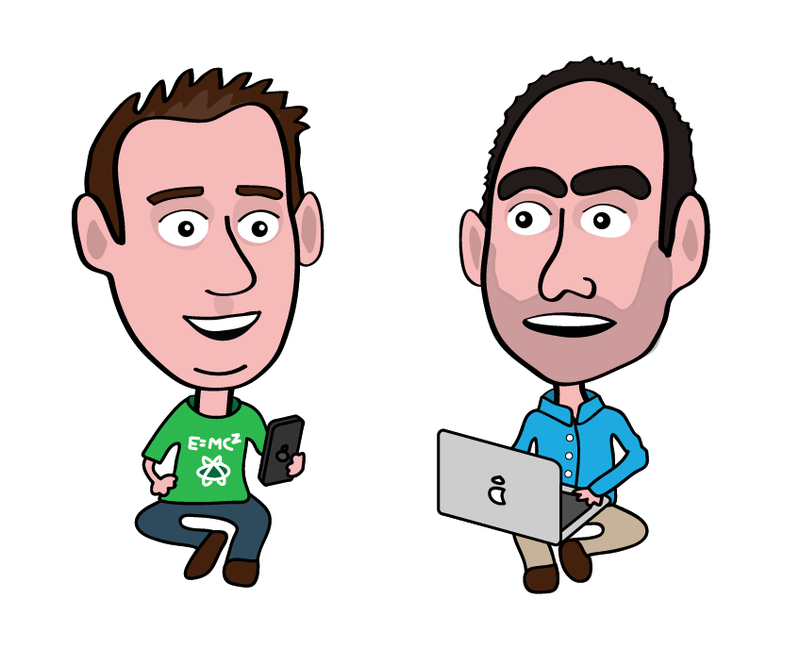 I've been away from this blog for a couple weeks now, but I've been very busy.​ First, I'd like to remind everyone about my other blog, VerticalAlignCenter.com that I run with my web designer friend Sam. I've been posting somewhat regularly over there, and will continue to do so for the foreseeable future. 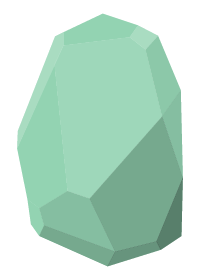 So lately my favorite thing to do has been scour the web for neat designs, and try to figure out a way to recreate them in Illustrator format. Sometimes the result looks good, sometimes not so much. Today I had a step by step helper tutorial, and it was mega fun. Lots of designers are what I call "painters" who make things in Photoshop using a wide array of tools that Photoshop has to offer. While that's terrific, and I even dabble in Photoshop myself from time to time, I feel the real power of design can be harnessed through vector illustration. I really like the effect that this tutorial creates. First of all, the attention to detail is fantastic, and ultimately the design really creates a sense of worth to it. Only downside I see is that I rarely have use for this level of macro detail, but I could make great use out of some of the patterns this provided. Just got back from an awesome week in Aruba. It was my first time to Aruba, and this trip showed me what I've been missing. 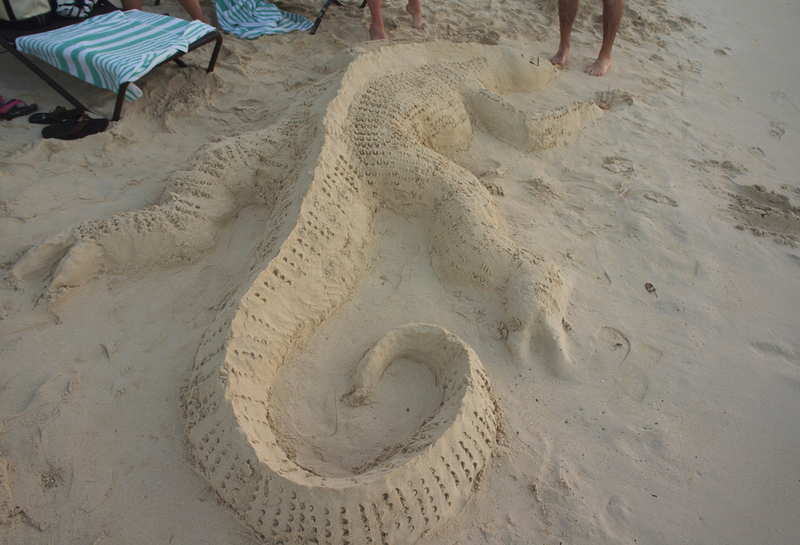 My friend @SamKligerman helped me make this awesome lizard sand thing. We made a bunch of different sand constructions during the week we were there. The first one was a huge pair of feet for us to put our actual feet in for pictures. The next day was this lizard, followed by some pyramids. Ironically, the pyramids were the hardest to perfect, since they're a geometric shape and we didn't have anything larger than a flip-flop to smooth things out with. This is what happens when you get two designers on a beach. Most of the time we just hung out on the beach, went swimming, and sat by the pool. I'll leave you with an awesome picture of Sam and I jumping into the ocean. It's been a week and a half since my last post. I've been very busy. The weekend before my last post, I was playing a game of Settlers of Catan with my friends. 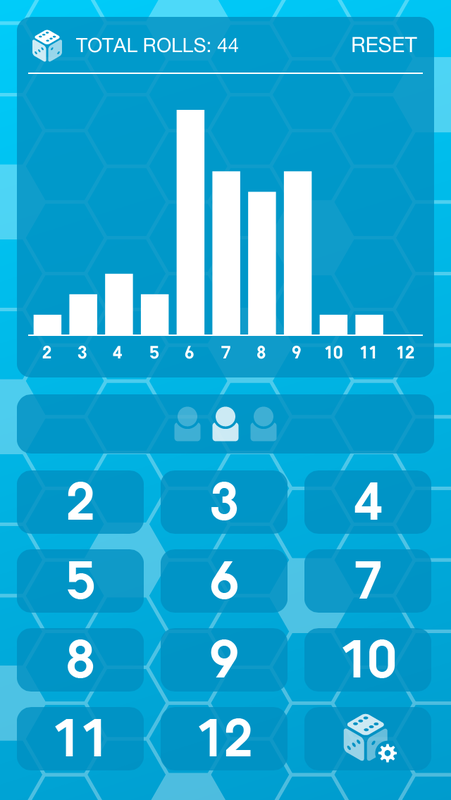 I've played the iOS version many times, and I have grown quite fond of the chart feature they include as a part of the game that shows how many rolls there have been of specific totals of dice. You see, in Catan you place houses at the intersections of hex pieces, and every time the number on a hex next to your house gets rolled, you get resources. It's a really brilliant game design, and my hat goes off to the people at Mayfair games. It really is terrific. I started playing an iOS knockoff of the game called Kolonists back when iPhone apps first came out. Same concept, terrible execution. Then I found out some of my close friends actually played the real game that the terrible iOS knockoff was based on. Thats when I got hooked. I downloaded the actual "Settlers of Catan" iOS app and played it like a thousand times. It was terrific. Anyway, enough backstory. I was playing with my friends, and I severely missed the ability to see how many rolls had been made of the specific totals. So I decided to do something about it. Originally the app's name was Catanion (like companion, but with Catan, clever I know...) Once I built the app I realized that people that play all types of dice and board games could be interested in this app, so I made it more generic. The hex background is definitely Catan inspired, however. I started the project because I have been running into some severe roadblocks with my tower defense game lately, and I really want to get something on the App store so I can beat my chest and say "I'm a real man" er... developer. Anyway, this concept seemed simple enough at the time, and the existing offerings on the app store are TERRIBLE. A week and a half later and its on its way to approval. UPDATE: The app is live in the iPad app store! Download away! So I just finished this awesome illustration of a McDonald's restaurant. I finished it using Adobe Illustrator, and I patterned many of the objects off of various isometric building animations I have seen over the interwebs. I've discovered two things: one, Adobe really needs to improve their perspective grid to offer an isometric version (or if they have it already, I couldn't find it) and two, it's extremely tedious work to create this type of a drawing. I'm using the graphic as a header banner for my McDonald's web portfolio page. I wanted to have something that really captures viewer attention and conveys a soft sense of the sort of work I do for McDonald's, which is typically preparing presentation materials and telling a larger story that involves user interface. I think my next one of these may be a drawing of my house like this. I really like they style, and I wish I had more opportunities to create this in my day to day work. I had been holding onto this poster since late June of 2011. When I ordered it from Naplab, I had this image in my head that I would just throw it up on the wall and it would magically stick. I found out shortly after I received it that this was not the case at all. The poster was too heavy to use poster tape, and plus it curled enough from being in a tube that you'd need something stiff and clear on top of it anyway. So I shoved the poster away in a closet and forgot about it. Fast forward to November 2012, my friend @samkligerman and I are at an IndyUX meetup with some fellow designers. 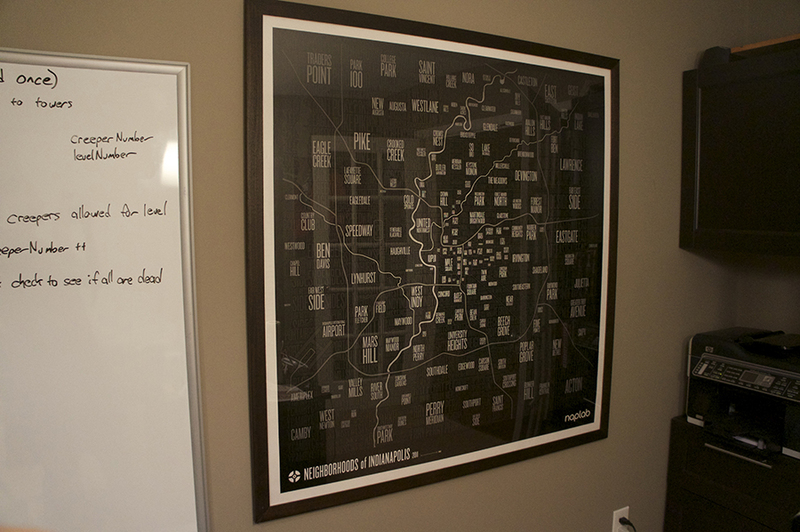 We see this poster hanging up on the wall at the Speakeasy, which is a design incubator here in Indianapolis. Sam made a comment to me that he has the poster at home in a tube because he never found an efficient way to hang it up on the wall. "Funny, I have a similar story", I said. I didn't think much about it, but Sam's on a big kick to get stuff done before his baby gets here in April (congrats btw) and about a week later Sam texts me that he found a plastic supplier for a piece of acrylic. So we split the cost on a big piece of Acrylic cut in half, and I get busy doing what I do best... making a solution out of the misc. parts and pieces I have in front of me. The frame is made from 2 separate 2"x1"x10' poplar pieces I bought at Lowes. I took a table saw to the 1" side and cut a 3/8" groove for the poster, acrylic, and backboard to go into. Then I just had to cut the pieces with a radial saw at the proper length, brad nail them together, and voila, we have a poster. The construction didn't leave much to hang it with, but it turned out that mirror hanging hardware worked just right with the size groove I had on the back. I used a dark stain to match the wood in my office, and put two coats of polyurethane on it to smooth it up and protect the finish. With CES 2013 underway, its easy to see that digital interface design is going to be a huge industry this year. Many companies are using touch interactions on both large screens and small to captivate their clients. What many of these products use are sideshows created from R&D software, booted up for a tradeshow experience. Very few use tried and true software with actual interaction design expertise and experience applied to it. So here's my challenge to companies demoing new products this year. Create an experience that people are actually going to use. Many of these products are neat, convincing, useful, etc... but fail to get off the ground because not enough thought was put into their UI. Lets change that. Together. I have a pet peeve for the sandwich shop industry. Each time I order my sandwich, I have to go through the same rigamarole of telling the cashier what sandwich I want, that I want it on wheat bread, that I don't want tomato, and I want yellow mustard instead of their nasty spicy mustard. This whole system is prone for error, as today I got a sandwich on white bread (which was surprisingly delicious). Enter technology - what if I could just scan in my frequent flyer card at Firehouse subs and my previous order is automatically populated to the screen. This could be done with old fashioned plastic cards, HID cards, QR codes, Passbook, or even facial recognition. No more yelling over the crowd or racking my brain to figure out what else I forgot to mention. Bam --> sandwich. Just like it ought to be. Sandwich people, you know who you are. Make this happen. Just got an iPad mini last month, and I LOVE it. I'm not a big fan of the original iPad. My wife has had it since the iPad 2 came out, and she's frequently not using it, so I've had plenty of time to use it myself. I never found myself reaching for it. It was just too big. I mostly read books from my tablet (I had a Kindle Fire before I bought my iPad Mini). My reading occurs at night, in bed next to my wife. She's asleep, so I can't turn the lights on. I actually have to turn the tablet down to the lowest possible brightness setting to keep from going blind in the middle of the night usually. With the full sized iPad, i'd have to hold it with two hands, and even then my arms would get tired after 20-30 mins of holding it. Enter the iPad mini. It's shockingly light, and the size is spot on for most of the interactions you do with an iPad. I know, I know, it doesn't have the Retina display, but its still very readable. The Kindle app is completely unphased by the lack of Retina support. I'll admit the web browsing experience suffers, but even that is manageable on most sites. I certainly wouldn't trade that for the weight though. It's so quick to pick up, and it feels solid enough to hold tight. The proof is in how much reading I've done lately. Last month I read 3 books, all on the Mini. Two John Grisham books (the Litigators, and the Racketeer, which I recommend just the Litigators) and 50 Shades of Grey. Just last week I read one more book by the world's greatest Sci-Fi author, Hugh Howey (Second Shift). Also battery life is excellent, and if you're in the lightning connector camp with an iPhone 5, you'll appreciate the universal connector (and how easy it is to use). Anyway, enough with the praise. Go get an iPad mini.